The smoke could be seen from Kensington, black plumes against the highveld blue of an early morning autumn sky. Twitter announced it: “Fire at The Star newspaper building”. 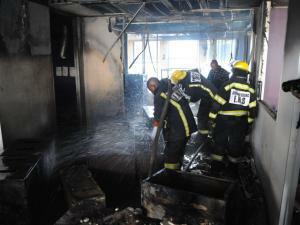 A fire took out part of the second floor of the building. Fire engines pushed through rush hour traffic and spectators watched smoke seep from the windows. 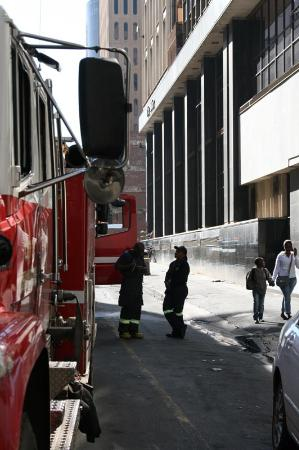 It didn’t take the firemen long to douse the flames, Johannesburg’s oldest newspaper has seen worse. The miners burnt The Star building to the ground during the strike of 1913. It was the firemen’s hoses that did most the damage. Water gushing from the second floor took out newsroom computers and my notebooks. They now lie in a heap, water damaged and muddled up. With dead computers and a water logged editorial department, us journalists are now homeless. Finding desks with computer terminals meant having to fraternise with the enemy. The empty desks are in the sub editors department. The sub editors are the guys that slash journalists’ stories, sometimes to the quick. They complain about misspellings and get pedantic about caps, commas and other squiggly things. Some of them eyed us suspiciously, a few even grumbled. But as the day wore on, interaction between the two tribes grew. New subeditors introduced themselves, a sub dug into his pocket and handed a journalist change for the vending machine. There was the sound of banter in the subs room, not heard for a long time. A camaraderie not seen, perhaps since those miners set fire to a newspaper nearly a 100 years ago. This entry was posted in Media, stories behind the news, Uncategorized and tagged journalism, Newsroom, Star, The Star newspaper fire. Bookmark the permalink.